A few weeks ago I reviewed Bumble and Bumble's Surf Spray, which is a sea salt spray for your hair. 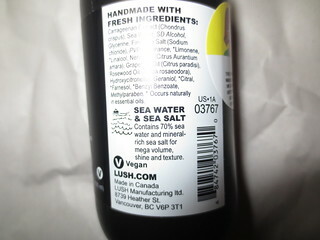 Now I have Lush's Sea Spray* ($12.95 CAD). This Summer I've been a huge fan of sea salt sprays, since I've been wearing my hair naturally wavy. I like to stay away from using heat on my hair during the hot Summer months, so a sea salt spray is perfect for my needs! 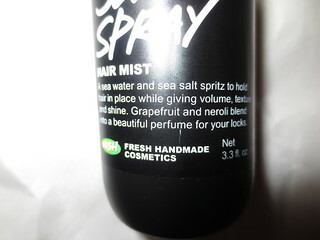 Lush's Sea Spray has a really nice mix of neroli oil and orange flower scents, which make your hair smell lovely. I like to use salt sprays on dry hair, as I typically wash my hair at night, and style in the morning. My hair is naturally wavy, and I find that Lush's Sea Spray really helps to add a beachy vibe to my hair. I go light-handed with this product though, because it can turn my hair a bit crunchy if I use too much. Once I've sprayed my hair, I like to tousle my hair with my hands, and then I'm good to go! This product adds body and a nice added wave to my hair. I've you're looking for a hair product to add some wave, shine, and texture to your hair, then I would try out Lush's Sea Spray. It's a lot cheaper than Bumble and Bumble's Surf Spray, and you get similar results. Have you tried out Lush's Sea Spray, or any other sea salt sprays? Which are your favourite? We have not tried this one but I'm taking the B&B and the Not your mother's sea spray with me when I go to Mex. in October.